Those Celebrating Birthdays are: September 4, Abigail Mousseau, Sylvia Wallace, Nathan Kennedy, Tracy Roode; September 5, Tonia Snedeker, Angie Spradling; September 7, Arthur Harnden, Jr., Shane Boudreau; September 9, Todd Drew, Dennis W. Chagnon, Ashley Stearns; September 10, Stephen Catalano, Tony Scopa. A Very Happy Birthday To One and All! We are updating our birthday and anniversary lists and need your help. If you would like your name to continue to be printed with your birthday and/or your anniversary date, then give us a call at 435-6291. If we don’t hear from you, we will remove your name. The Faith Formation program at Our Lady of Lourdes Church in Pittsfield, is holding Catholic Religious Education Classes for youth, children and adults. Join us for Orientation Day, Sunday morning, Sept. 8, from 9-10 am at Our Lady of Lourdes Rectory located at 20 River Road in Pittsfield. For more information, please contact Jeannie Garcia at 269-4143, 942-8716 or the rectory at 435-6242. The First Congregational Church, 24 Main Street, Pittsfield, will begin their children’s Sunday School on Sunday, September 15. Class will begin at 9:50 a.m. and end at 11 a.m. Worship services begin at 10 a.m. with Fellowship Hour following. Everyone is welcome to attend. For more information, contact the church office at 435-7471 or consult the church’s website at: pittsfieldcc.com. Concord Regional Visiting Nurse Association is offering Better Choices, Better Health™ in Pittsfield, a six-week chronic condition self-management program to help older adults gain the confidence needed to effectively self-manage their chronic condition and improve their activity levels. The program is on Tuesdays beginning September 10 from 9:30 a.m. to noon at Pittsfield Senior Center, 74 Main Street in Pittsfield. Chronic conditions include but are not limited to congestive heart failure, chronic obstructive pulmonary disease, diabetes, asthma, and arthritis. • Find practical ways to deal with pain, fatigue, and stress. • Discover better nutrition and exercise choices. • Make informed treatment decisions. • Learn better ways to talk with their physician and family about their health. • Obtain the support they need. There is no fee to attend this program and space is limited. To register, call Concord Regional VNA at (603) 224-4093 or (800) 924-8620, ext. 5815. 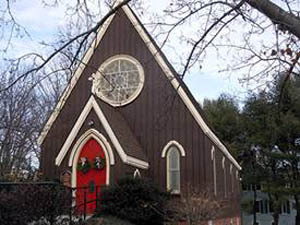 The public is invited to the sanctuary of St. Stephen’s Episcopal Church located at 50 Main Street on Thursday, September 12 at 7:00 pm to enjoy the ambiance and the architecture of this little church as its history is presented. Father Curtis Metzger, will welcome the Society. An architectural overview will be included as well as an opportunity to put into perspective the expanding choices in worship that came to Pittsfield in the context of the gathering storm of the Civil War. After the presentation, the Society is invited to enjoy a social hour in the undercroft of the church. 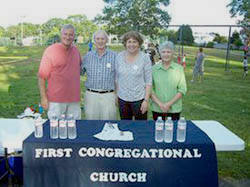 St. Stephen’s parish, during its 150th anniversary year, is honored to host the Pittsfield Historical Society. 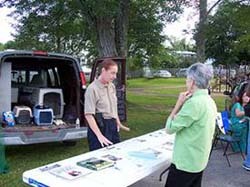 The evening of August 6 proved to be balmy and rain-free, the perfect atmosphere to draw more than 200 people to the countrywide event, National Night Out. Pittsfield even had guests from as far as Maryland. 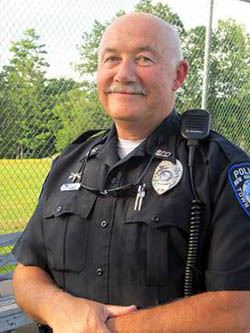 “The difficulty in participating in a nationwide community event like this is the fact that there are only so many resources we can draw on,” comments Officer John Webber who was in charge of obtaining bike helmets for the bike safety obstacle course. “When we go to the bigger chain stores for donations, we are told they can’t donate to us because they are donating to other National Nights Out in the area.” This doesn’t hinder the local efforts though because Pittsfield is lucky enough to have our own cache of donors who help with this special night. Many thanks go out to the many people who made this evening a success. Because of this team effort National Night Out was able to have: a car show arranged by Lisa and Eli English, a bouncy tent supplied by Joe Darrah Enterprises and manned and timed by Officer Gauthier, a K-9 demonstration by Officer Di George and K-9 Cache, a S.W.A.T. demonstration by Sergeant Cain, a bike safety course by Officers Webber and McCormack, hot dogs supplied by the Police Association, cooked expertly by Officer Cassavaugh and served by Liz Hast and Heidi Darrah, pizza from Jack’s, Town and Village Pizza, informational tables set up by The Pittsfield Players, The First Congregational Church of Pittsfield, Pittsfield Listens, The Pittsfield School District, Pittsfield Youth Workshop, Pittsfield Youth Soccer, Pittsfield PTO, face painting by Donna Keeley, a dunk tank provided by Cub Scouts pack 84 and manned by Officer Rush and Sergeant Walter, Questions and Concerns addressed by Animal Control Officer Anne Taylor, the Pittsfield Fire Department with Fire Engine and fire hats for the little ones, State Trooper, Stephanie Bosche brought her cruiser to add to the car show, Steve Catalano provided hayrides courtesy of Appleview Orchard, Captain Hague of Merrimack County Corrections, Bob Legg and Meggin Dail for photographing the event. Plans are already in the works for next year; mark your calendars for the first Tuesday in August 2014. Officer Adams was on duty this night. 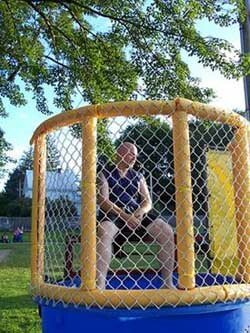 Sergeant Walter loves the water and taunting the participants to dunk him. Animal Control Officer, Anne Taylor, was on hand to demonstrate the actual temperatures when you leave an animal in a hot car. The First Congregational Church of Pittsfield got the Word out. 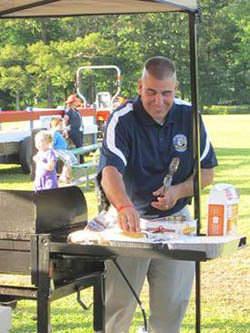 Officer Cassavaugh served up hot dogs and a smile. 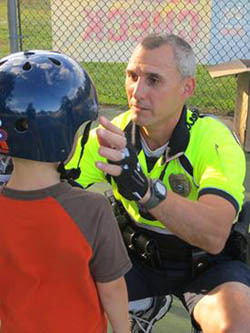 Officer McCormack checked the fit of the bike helmets given out that night. Now’s the time to get your tickets for this year’s Cabarets; that’s right, this year the Cabaret for a Cure is in two locations, Wolfeboro at the Glendon Street Theatre on Friday, September 13 and Pittsfield at The Scenic Theatre on Saturday, September 14. Both Theatres open their doors at 7 pm for refreshments and raffles and both shows start at 7:30. Seating is general admission and with the popularity of last year’s show we advise getting your tickets reserved and showing up at 7 pm to get your seat! This year’s show features some fabulous people giving you some fabulous entertainment. Maye Hart and the cast will open the show with “Cabaret” and a tribute to Elsie Morse. Gerri Casey will entice the audience with “Razzle Dazzle” and “Big Spender” and Megan Rohrbacher and Kaylin Dean wow with their rendition of “That’s Life” and “The Cup Song” while Angelo Gentile (of The Rockin’ Daddios) reprises “I Once Knew” and Keith Belanger tries out some Willie Nelson. Amid the variety of cast numbers such as “Let it Be,” “I’m a Woman” and “This is The New Year,” there will be dramatic moments shared by Meggin Dail, “Happy Mother’s Day”; Kate Crary, “No Regrets”, Art Morse, “10 Things” and Nella Hobson’s “Quilting With Elsie” that will touch your heart, inspire and bring a tear to the eye. We strongly advise reserving your $10 ticket now by calling 736-8073 for either show or finding us on facebook at Cabaret for a Cure because besides the terrific acts we have lined up we have also scored dozens of wonderful raffle prizes that you can only get by coming to one of the Cabarets. At the Pittsfield Cabaret 20% of ticket sales will go toward keeping the theatre in business by supporting the Sprinkler Fund. Thanking you in advance for supporting the American Cancer Society breast cancer research and The Pittsfield Players as well as Wolfeboro Community Theatre, The Village Players. To be hereby known that you or your representative, needs to be involved in the running of our town. We need conversation to determine whether we can all row in the same direction Tuesdays, 6 pm at the Town Hall (except Christmas). We need to all step it up a notch. Come to the meetings, add what you can. Weekly first meeting, September 3rd. Come on. Summer’s over. Let’s get to work! And always remember the people who came before us. They got us this far. To not give 100% at this time would be falling short. There was an Animal Control call recently that resulted in an individual being bitten by a skunk. As is protocol the skunk was put down and its remains brought to the state lab for testing for rabies. The test came back positive and the individual was notified so that they could begin undergoing treatment. Please, when you see a wild animal in a residential area, leave it alone. Do not go near it, touch it or try to capture it. If the animal looks as if it’s acting odd to you, call the police and/or Fish and Game and let them handle the animal. Now that we know of one case of rabies in the area there is potential for others. Please be safe and let us determine the threat of the animal. As school goes back in session we at the Police Department remind you not only to be wary of the kids on crosswalks and on bikes in the roads, but also to know that when you see a school bus stopped with lights flashing and usually the driver side Stop sign out that you are not to pass or encroach on the school bus as it picks up or drops off children before and after and sometimes during school. Traffic must come to a stop in Both directions to allow children to cross the street safely. Furthermore, be reminded that unless the bus is on a divided highway, traffic is also to stop in both directions and again there is no passing. The fines and more importantly the consequences of your actions are steep. The Aviation Museum of New Hampshire is pleased that the Collings Foundation’s Wings of Freedom Tour on September 16, 17 and 18 is visiting Manchester-Boston Regional Airport adjacent to the site of our historic 1937 Terminal Building. Colling’s tour includes the B-24 Liberator “Witchcraft,” the Boeing B-17G Flying Fortress “9-0-9,” and the P-51 Mustang “Betty Jane.” The airplanes will arrive on Monday the 16th around noon and will be open to the public. Walk through tours of the aircraft are $12 for adults, and $6 for children 12 and under for access to all of the aircraft. WWII Veterans get into the ground tours at no charge. The Aviation Museum of NH will be open each day of the visit; admission is $5 for adults, $4 for seniors and veterans, and $2.50 for children 12 to 16. Hot dogs and soft drinks will be available outside the museum on Monday and Tuesday from 11:30 AM to 1:30 PM. The museum will be open on Monday 9/16 from Noon to 5:00 PM; Tuesday 9/17 from 9:00 AM to 6:00 PM; and Wednesday 9/18 from 9:00 to Noon. For information, contact the museum call (603) 669-4820. The “Wings of Freedom Tour” has two goals: to honor the sacrifices made by our veterans that allow us to enjoy our freedom; and to educate the visitors, especially younger Americans, about our national history and heritage. The Foundation encourages people to tour the planes, talk to the veterans who come to visit the aircraft, and participate in a “flight experience.” In twenty-one years, the tour has made more than 2,378 visits to airports across the United States and Alaska. While the exact number of visitors is difficult to gauge, it is estimated that between 3 and 4 million people see these war birds annually.